wish to construct trellis cross arms for the modified Munson training system can obtain many of the benefits of that system by utilizing a more simple two-dimensional training system called 4-arm Kniffin. William Kniffin developed this training system for grapevines in the Hudson Valley region of New York in the 1850s. He utilized four long fruiting canes for each vine. These canes were tied to two trellis wires at varying heights on the trellis (Fig. 3a). In later years, as vines developed a larger size due to improved cultural practices, the fruit along the lower fruiting wire of vines with 4-arm Kniffin training did not develop or mature as well as that situated along the top wire. Therefore, the modified version of Kniffin's training system recommended here places all four fruiting canes on two wires at the top of the trellis (Fig. 3b). This training system, like modified Munson, requires shoot positioning to ensure good fruit maturation (Fig. 3c) and the development of fruitful canes. Hudson River Umbrella — Growers are urged to use either modified Munson or modified 4-arm Kniffin for table grape production in temperate climates because the effort required to prune out and tie long canes each year with these training systems will be rewarded in fruit quality. However, a grower who seldom experiences winter injury to vines and wants to minimize spring vineyard chores should use Hudson River umbrella (HRU) training for table grape production. HRU is suited for table grape production because it places fruit relatively high on the trellis and is compatible with shoot positioning. 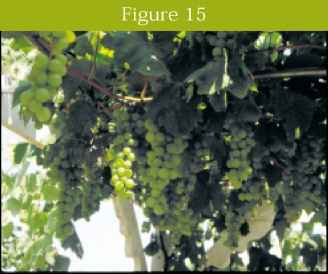 Moreover, HRU requires low vine maintenance each spring because vines are semi-permanently attached to a simple, two-dimensional trellis (Fig. 1f). To establish HRU training, grow vines using standard vine establishment procedures for the first two years (Figs. 8, 9, 10). When pruning for the third growing season, choose a cane high on the trellis that can be pruned and then wrapped gently around the top wire. This will become a cordon. Avoid using a cane if it has been girdled by the twine used to tie the vine to the trellis (Figs. 1a and 1b). Prune the cane long enough to reach the top wire and then extend to the end of the vine space (Fig. 1d). If the vine has two trunks, repeat this process with the second trunk to establish a cordon on the other half of the vine space (Fig. 1d). When growing single-trunked vines, use a second cane on the same trunk to establish a cordon on the other half of the vine space. After the canes for the cordons have been pruned, prune a renewal spur below each of those canes (Fig. 1d). This is insurance in case shoots don't develop well on the canes you've just chosen for cordons so that it becomes necessary to reestablish the cordon again the following year. When managing double-trunked vines, the most useful renewal spurs are those that will develop shoot growth away from the middle of the vine (Fig. 1d). After canes for cordons and renewal spurs have been selected, remove all other canes from the vine (Fig. 1d). When tying the vine in the spring, start with a loose loop of twine around both canes and the top wire (Figs. 1d and 3d). Then wrap one cane around the top wire so there is one revolution every 18 inches. Tie the end of the cane tight to the wire (Fig. 1d). Loose fitting ties can be used to keep the cane in contact with the rest of the wire. Repeat these steps for the second cane on the other half of the vine space. Position shoots during the third growing season (see section on shoot positioning) so they hang vertically from the cordon (Fig. 1e). Prune fruiting canes the following winter so they are spaced along the cordon (Fig. 1f). Prune canes long enough to reach the lower wire; this will often require 7 to 10 nodes per cane. Canes that hang vertically will not require tying. Those that run horizontally should be tied to the lower wire (Fig. 1f). Prune canes along the cordon that are not needed for fruiting to renewal spurs (Fig. 1f). Shoots from these renewal spurs will be the source of future fruiting canes. Maintain trunks and cordons on hardy vines for 10 to 12 years. Then renew trunks from suckers (Fig. 4). The complete process of renewing a vine trained to HRU takes about three growing seasons. Fan Training — Homeowners or hobby farmers may attempt table grape production on sites not really suited for this purpose. In these situations, low winter temperatures may cause vines to be killed to the snow line or the ground. The best advice for this condition is to cease efforts at grape production or at least to seek hardier, more reliable varieties. Nevertheless, for those with persistence and determination, it is often possible to overwinter even cold-tender grape varieties in a harsh winter climate by employing special strategies, including the use of the fan training system. The advantage of the fan training system on marginal vineyard sites is that no permanent parts of the vine are required. Multiple trunks are spread (fanned) out from the base of the vine (Fig. 4), and a generous application of renewal spurs near the ground makes frequent trunk renewal possible (Fig. 4). In the fall as soon as vines are fully dormant, a portion or the whole vine is freed from the trellis and laid on the ground. Various objects, from rocks to landscape staples, have been used to put as much of the vine in contact with the ground as possible. If the location experiences reliable snow cover, snow alone may insulate vine tissues from winter low temperatures. Other protective measures — including covering vine tissues with soil, straw, leaves, etc. — may be used to protect vine tissue from cold. In the spring before ground heat can cause the buds to swell, vines are pulled out of the mulch and pruned to create two to four trunks, each with a fruiting cane. They are fanned out and tied within the vine space (Fig. 4). 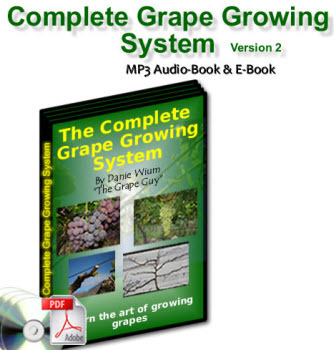 This is a vine training system for vine survival on marginal grape growing sites. Arbor Training — Grapevines are an attractive landscaping opportunity for homeowners when they are properly managed. Unfortunately, many homeowners grow grapevines so they look like a sprawling weed along a fence. 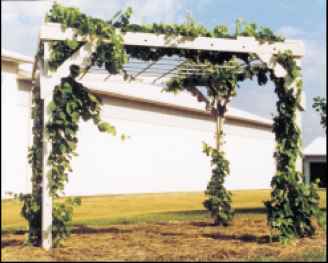 For those willing to make the effort, grapevines on an arbor are an unusual and rewarding variation in horticultural landscaping. Growing grapevines on an arbor can provide luscious, juicy grapes on big, full clusters within easy reach as well as a pleasantly shaded area on a hot summer day (Fig. Fig. 15 - 'Marquis' grapes grown on an arbor. 3/4" plywood corner support with dimensions of 12" x 12" x 17"
15" 15" 15" 15" 15" 15" 15" 15"
Solid lines indicate 'conduit at a right angle to those shown. top view b.side view c. top view with placement of the cordons, fruiting canes and shoots of the vines and d. a close up of the top grid of the arbor to show the use of golf tees as wedges to hold the conduit in place. 16 - Schematic drawings of a table grape arbor showing: (a) top view; (b) side view; (c) top view with placement of the cordons, fruiting canes and shoots of the vines; and (d) a close-up of the top grid of the arbor to show the use of golf tees as wedges to hold the conduit in place. Fig. 17 - A 10-foot-square arbor for table grape production. 'Marquis' grapevines were planted in each corner and are near-ing the end of their first growing season. 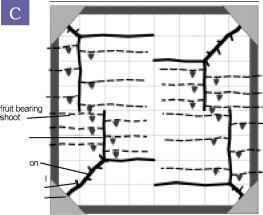 This design can be constructed from readily available materials. difficult when working below the arbor, the recommended arbor design (Fig. 16) has a unique feature to make pruning easier. The conduits forming the grid of the arbor can be removed by tapping out the golf tees that hold them in place (Fig. 16d). When pruning vines on this arbor in the spring, two or three conduits are removed from the arbor. Then pruning and tying can be performed while standing on a stepladder and looking down at the top of the arbor. 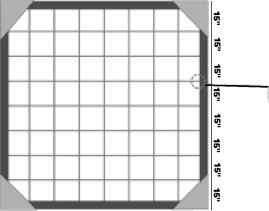 How to construct a modified munson trellis system? 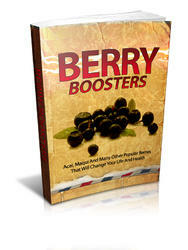 How to grow grape the modified munson? How to grow grapes on fence?